It was over a week ago when hubby and I put up our Christmas tree. I had to bug him a few times before he agreed to go get the box upstairs, take out the tree and assemble it. My niece Vernice was so excited and she even helped us in putting it up. The three of us put up the branches and when the Christmas tree was already standing, I started decorating it. I really enjoyed putting the Christmas ornaments around the Christmas tree. I used the same decorations that I used last year but I thought I needed to add more flowers. So when I went to the mall the following week, I bought one dozen orange poinsettias and a tie/ribbon in addition to my red poinsettias and apple decors. After I added the decors when I got home, I think my Christmas tree looks a lot better. The orange poinsettias match the seat cover of our living room set. I was happy with the result. I just wish we have a more spacious living room. I bought this 6 feet Christmas tree in Texas in 2003, a day after Christmas. It was on sale, 50% off and I bought it for $20. It was really a good deal. We shipped it here in PI when hubby and I decided to come here as missionaries in 2009. I plan to use it as long as it's still usable. Here are some pics of our Christmas tree before I added the orange poinsettias and the tie or ribbon (I don't really know what they call that thingy). It look so reddish and boring. I think the addition of orange flowers made the difference. 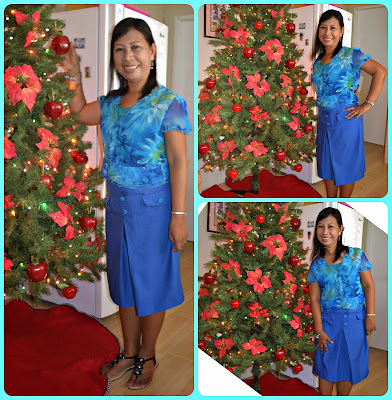 Hubby took these photos 2 Sundays ago after coming home from church. Wow! Very colorful ang tree ninyo! I agree, Manang. With d addition of the orange poinsettias the tree was transformed. I can't believe what color can do. That's my husband's favorite color - orange, kaya yun din ang color car namin. P.S. Mukhang orange din yung couch ninyo. OMG! My husband will be in orange heaven if he goes to your house. Your hubby chose a very good and lively color, orange for your car. I like that color too next to pink that's why I chose that color for the seat cover of our living room set. Oo nga ading, na-transform yong Christmas tree ko after adding the orange poinsettias. Boring na kasi kong puro red na lang.